Hello and welcome to another Digital Tuesday Challenge. This week's challenge is Hosted by me, and I was inspired by some of the new hot color trends I saw on Pinterest, so I decided to have a Color Challenge. My inspiration picture for the challenge is posted below the card I made. I want you to use the colors Coral and Tan/Kraft on your card or project, and be sure to include at least one digital element. Our sponsor this week is Robyn's Fetish. To make my card I used the Robyn's Fetish image 'Katie Reading'. My sketch is from Splitcoaststampers (SC399). I used Kraft paper for my background, I stamped pencils all over the Kraft paper using Soft Suede ink. I printed the image twice, then cut out and popped the book up on dimensionals. My sentiment is from Papertrey Ink, the flowers are an MFT die, and the sentiment die is from Spellbinders. And here is the inspiration photo I drew the color challenge from. Would you ever have thought to put these two colors together? I wouldn't have, but it really works! Hello! Today I have my August Christmas Cards to show you. I am really pleased with the way these cards turned out. As most of you already know, I play the Splitcoaststampers Christmas Card Challenge where we make Christmas Cards all year long so were not scrambling to make cards during the busy Holiday Season. I have committed to make four Christmas Cards a month, so that I'll have about fifty cards at the end of the year. Making Christmas Cards all year long is a very difficult resolution to keep. As each month begins to come to an end, I usually end up panicking and scrambling for ideas to make some quick and easy cards. This month was no exception, and it was even more difficult because I had a out of town wedding to attend, I had to get my son off to college this weekend, my full time job was more stressful than usual this week, plus I had to decorate my home and church for Fall, not to even mention my fall gardening chores. Yikes! Talk about busy! So I was looking for some really quick and easy ideas for making fast Christmas Cards on Pinterest and saw a simple card which had a round doily die cut on the corner of Kraft paper with a simple black outline stamp on it. I thought, 'hey, maybe I could do that with my snowflake die!'. Well, as I searched through my ancient Sizzix dies (these things really are antiques by now!) I found four Christmas themed dies: a Gingerbread Man, a Christmas Tree, a Snowflake, and a Snowman. Perfect. I used the same layout as I saw on Pinterest, but I added designer paper to the background, ribbon, embellies, and a sentiment. I'm not even going to give you the link, because my cards look NOTHING like the original...I used the original simply as a starting point for a whole other concept. Here is the Gingerbread Man Card. I popped him up on dimensionals. The background paper is DCWV 'The Christmas Matstack'. I echoed the snowflakes in the designer paper with felt snowflakes purchased from JoAnn's Fabrics and Crafts attached to my Stampin Up! retired Riding Hood Red ribbon. All the tags in all the cards were made with a Martha Stewart punch. The candy cane is a button. I used a white gel pen for the frosting on the cookie. My next card uses the Snowman Die. The paper is Cosmo Cricket 'Dear Mr. Claus'. The sentiment is from the pad too. I just cut it out and glued it to his 'hand'. Ribbon and button are from JoAnn's Fabrics and Crafts. My next card uses the Snowflake die. I covered it with glitter and attached it to a piece of snowflake designer paper from DCWV 'Peppermint Forest'. I used white organza and silver ribbon for embellishment. And finally, my favorite card used the Christmas Tree Die. I attached jingle bells to the plaid ribbon. The paper is also from the same Cosmo Cricket pad in the Snowman card above. These cards were so quick and easy because there was no stamping other than the sentiment and no coloring. All but the snowman card used only one sheet of designer paper, keeping the layering minimal, yet, still providing so much visual interest and texture. Hello and welcome to another Digital Tuesday Challenge. This week's challenge is a sketch challenge. A picture of the sketch to use for the challenge is provided below. Simply make a card or project using the sketch provided and be sure to include at least one digital element. Our sponsor this week is Stitchy Bear Digital Stamps. To make my card, I used the Stitchy Bear Image 'Lunch Time'. I flipped the sketch sideways so that it would work with the image given to me to use. All the paper and sentiments are from the Summer Fresh stack. I used a white gel pen on the apples and a spica pen on the butterfly. I made the sun using my Cricut Expression and used my sewing machine to attach the sentiment. The chevron strip was made with the new MFT Die. If you'd like to play along with us this week, simply click on the Digital Tuesday Challenge Blinkie and it will take you directly to the Challenge Site with further instructions. Hello! Today I have some exciting news for you. One of my good on-line friends, Diane, started her own on-line digital stamp company called 'Daydream Designs' and asked me to be one of her new designers. I have to admit, at first I was a little hesitant, because I am usually sooooo overwhelmed and busy with work, church, family, house, etc., but I have so enjoyed working with Diane on a previous design team and her requirements seemed very flexible, that I decided to give it a go. I've always enjoyed working with Diane's images, but most of all her sentiments. So many digital designers have great images, but no sentiments to go with them. I've always found it a bit frustrating to have 'search for that perfect sentiment' to go with the image. Diane is so wonderful with words (just go read her Blog and you'll see) that creating touching sentiments is second nature to her. Today I am going to show you a brand new set that Diane created called 'Nest to Sky'. I'm an avid bird lover so I thought this set would be the perfect one to use to launch off my new design team announcement. I used a sketch from The Deconstructed Sketch (Sketch 65) and paper from My Mind's Eye Stella Rose 'Gertie'. The circles and ovals are Nestabilities, and the clouds and flower is from MFT. I added some brads and pearl for embellishment. This image is available in both outline and pre-colored. I used the pre-colored version since I'm very short on time today. And my sentiment is retired Stampin Up! 'A Little Birdie Told Me'. The inside of the card reads 'it's your birthday!'. Diane gathered together a lot of great papercrafters to be on her 'dream team'. They are all listed in my sidebar for you to visit! Hello! No paper crafting post today. As most of my readers already know, I post mostly pics about paper crafting, but I also have many other hobbies and interests, and one of them is traveling, so today's post is about my very first camping experience in a tent. Quite the adventure it was! Devil's Lake is located in the middle of the State of Wisconsin. We live about 3 hours North of there, so we could have just went for the day and came home at night, but it was only $15.00 to spend the night in a tent there, so we decided to try it. I wasn't sure I would like to 'tent camp'. Although I love nature, I prefer to spend my days in it, and my nights in a cozy hotel room with a hot shower. But other than the fact that I had to go the whole weekend without makeup and a blow dryer, I found I really enjoyed myself! Our tent was quite roomy, we comfortably fit five people inside a four person tent and it did not feel cramped. We had an air mattresses, so I was comfortable that way, but I did wake up often in the night because I was cold. Note to self: even if it's in the eighties during the day, it's cold sleeping at night: BRING MORE BLANKETS! Here is a picture of our tent and campsite with my daughter and husband in the foreground. We found the campsite to be quite well accommodating. Although there are people nearby, like most campsites, the grounds were well maintained and we liked the surrounding 'woods'. We nestled our tent underneath some trees, but there was plenty of room for another tent on the other side of the fire pit. They also had outhouses about a city block's walking distance from our site. We had hot dogs and marshmallows cooked on our grill with wood collected from the site. Those hot dogs tasted mighty good after a long day of hiking and swimming, but another note to self: BRING MORE FOOD NEXT TIME! I didn't foresee how hungry we would all be and only brought 8 hot dogs, a can of beans, and some chips to eat for dinner. Now normally, that's about all we'd ever eat as a family of five, but after hiking all day we all wanted more to eat. They do have a nice restaurant on the grounds (where I got my coffee early the following morning), but no one was that hungry to leave their cozy site and go eat over there. Next time I'll bring some potatoes to make baked potatoes for the evening meal, and hash browns for breakfast the next morning. We made lots of mental notes of what to bring for our next trip! I have no idea why this picture turned itself sideways after I turned it right side up. Sorry. But we thought this tree was so interesting with all the Wood Pecker holes. That is my daughter Ashley in the picture. This is me (with NO Makeup!) and my husband overlooking the lake. And here is a shot of my son Jordan looking at the view. Devil's Lake is known for their Glaciers, falling Rock, Bluffs, and perfect swimming conditions. After our morning hike, we ate a picnic lunch at the beach (sorry, I never took pictures of the beach) and spent the afternoon in the balmy waters and basking in the sun on the sun. The water was so warm...almost like bath water, and crystal clear too! Not filled with seaweed like a lot of lakes are this time of year. It's the perfect beach to go to if you have young children or can't swim a stroke like me. The water is shallow for quite a ways! I'll have two more separate posts about the other trails we walked in later posts. Hello. I had some rare spare time today so I decided to make a more masculine birthday card, since I'm always short of those! I pulled out a very old retired Stampin Up! set called 'Definately Decorative Fern's' and stamped it twice: once in Mellow Moss ink, then, without re-inking the stamp, I stamped it again off to the side of the first image. 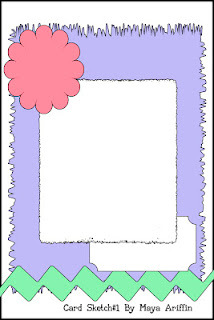 I then added another retired Stampin Up! image from the 'Upsey Daisy' set for my sentiment. A wooden button, some ribbon and brads, and wa-la! My card is done! The green designer paper in the background is also retired Stampin Up! from the Patterns Pack II Collection. Hello and welcome to another Digital Tuesday Challenge. This week's challenge is a Recipe: Use the following 'recipe' on your card/project: 1 image, 2 papers, 3 flowers, and 4 gems, and be sure to include at least one digital element too! Our sponsor this week is MyGrafico and they are giving away one digital stamp set and 20% off an in-store purchase to one lucky randomly chosen winner. To make my card I used a Pixel Paper Print image from the 'Monkey Girl' set. My Sketch is by Sweet Sunday (Sketch 163) and my papers are by October Afternoon. I actually had a hard time with this challenge because it was difficult for me to add all the embellies. I wanted to stop after only one flower and not add any gems at all. I'm very clean and simple when it comes to designing. But I like the end result. If your wondering how I have '3 flowers' if you only see one, I'm counting the flower in the image as one flower, and I layered a smaller flower on top of the big flower. I just couldn't handle putting THREE flowers on my card. LOL! I also printed the image twice and popped just the head up on dimensionals.